Imagine conducting an MRI, on a single cell instead of the whole body - taking a picture of the molecule or just a group of molecules within the cell, identifying and examining the problem areas within DNA, and coming up with a more precise diagnosis and patient therapy. This is possible today through the precision of Quantum Computing and Nanotechnology built into an MRI equipment. In a recent news release IBM declared that they are very close to make a breakthrough in the realms of Quantum computing. As a result of some experimental successes they are closer to build the first Quantum Computer, that can take advantage of the oddities of quantum physics and could solve certain problems in seconds, that would otherwise take present-day computers billions of years to solve. Quantum computing is a computing system based on qubits as opposed to bits; where qubits (Quantum Bits) are basic units of information in a quantum computer. While a bit can represent just one of two possibilities such as 0 or 1, or yes or not, Qubits can represent many more options: 0 or 1, 1 and 0, the occurrence of multiple combinations of Qubits, and that too simultaneously. So, Qubit represents an array of possibilities and all can be calculated simultaneously taking probabilities in account. The Qubit concept deals with very small particles (subatomic particles). It has been proven that a subatomic particle can have different states simultaneously because the particles are never static. This is evident because they move very fast, close to the speed of light. So, a particle state of the particle (Qubit) looks different to different observers and the particle has several states simultaneously. That is why one subatomic particle can have different states and probabilities, at the same time. We can use it to replace bits and get better performance: Much better performance! And then, when you combine Qubits, that combination holds an exponentially larger amount of information than bits. Subatomic logic is much more powerful than binary logic used in normal computing. As a result, you can process complicated information faster. Its main applications are encryption, decryption, modeling, databases, voice recognition, structure recognition, simulation and artificial intelligence, plus many others yet non-existent applications. Imagine its utilization and effect in the realm of Healthcare, specifically e-Health. Volumes of electronically available Patient data, structured, modeled, simulated, and processed in fractions of seconds - artificial intelligence for diagnosis and condition predictability with almost 100% accuracy, will multiply millions of fold, surpassing unthought-of limits. Quantum Computing has also proved that two entangled particles share its existence. That is when one modifies its state, the other also modifies its own state simultaneously, no matter how far they are in the universe. That means we can "transport" information from one place to another without physical movement, just by modifying one entangled particle state. In e-Health, this could mean automatic remote and reliable diagnosis, with electronic patient information, through immediate communication with entangled subatomic particles. And, with nano-scale precision applications, this is just the tip of the iceberg. I like the word quantum. It's a very future sounding word. Fantasy writer Terry Pratchett likes it too, and uses it in his novels to describe anything that can't really be described or understood. Considering his stories take place on a world that drifts through space balanced on 4 giant elephants standing on a turtle, it's a word he uses fairly often. Quantum is like a bridge between what's possible and what's probable. It makes science fiction science fact, and it's here. Well, almost here. The issue of quantum computing has been puzzling researchers for roughly 3 decades, and now it looks like we're only a few short years away from buying them from our local tech stores. What's the big deal with quantum computers anyway? Well, they're super-fast and super-efficient, making current PCs look like the monstrous machines that took up an entire room when they were first developed. According to Fred Chong, from the University to California, a quantum computer would be able to solve in mere months problems that would take a conventional computer millions of years. The key to their "superness" is the fact that quantum bits or qubits are not bound by the conventions of time and space as we know them. Normal electrons spin either clockwise or anti-clockwise. Quantum electrons spin in both directions at once. This ability to transcend a single state of existence means that when they're used in computing, quantum electrons transform conventional "bits" into qubits. Conventional bits can be either a 1 or a 0, but qubits can be both at the same time. In quantum mechanical terms, the qubits exist in superposition, which leads to an inherent parallelism, which according to physicist David Deutsch allows quantum computers to work on a million computations at once. Current PCs can work on only one. One of the most important benefits of quantum computers, aside from all the other "superness", is that they'll make silicon based microchips obsolete. This is a good thing because within about 4 years silicon chips will have evolved themselves out of existence, being too small to be of any practical use. One of the ways in which they'll negate silicon chips, and completely revolutionise the way computers are wired, is through the quantum property of teleportation. Using teleportation, information about one particle will be transmitted to another without using any wires at all. In Star Trek terms, information is beamed from one particle to another. The nice thing about quantum is that there will always be enough power to do this. No flailing about in outer space, panicking about another Klingon attack for these babies. You're always good to go. Simple quantum computers are already in existence, but they're nowhere near achieving what they're capable of. In 2007, a Canadian company, D-Wave, created a 16-qubit (the goal is at least 30 qubits) quantum computer that could solve sudoku puzzles. Other quantum computers can solve the riddle of Schrodinger's cat (a cat in a box with poison, is it alive or dead? Until you open the box and have a look, it occupies both states, not unlike quantum electrons and qubits), considered one of the most important equations in quantum mechanics. It may not seem like much to the man/woman on the street, but it's enough to get quantum physicists out of their baths and running naked down the street with cries of "Eureka". While it may seem that the evolution of computers is about at its end, that is not the case. The next generation of computers is quantum computers. The reason behind continuing computer evolution is the continuing thirst we have for speed and capacity of our computers. Way back in 1947 an engineer and computing expert, Howard Aiken, predicted that all the United States need to satisfy its need for computers were six digital electronic computers. Other scientists and engineers that followed Aiken added to the volume they predicted as being adequately massive, but were also far too conservative. What none were able to predict that scientific research would produce voluminous quantities of knowledge that needed to be computed and stored, nor did they predict the popularity of personal computers, and the existence of the Internet. In fact, it's hard to predict if humankind will ever be satisfied with its computer power and volume. A basic computer premise, called Moore's Law, says that the number of a microprocessor's transistors doubles every 18 months and will continue to do so. What this means is that by no later than 2030 the number of microprocessor circuits found in computers will be astronomically high. This will lead to the creation of quantum computers, whose design will use the power of molecules and atoms for processing and memory tasks. Quantum computers should be able to perform specific calculations billions of times more quickly than can the current computers that are based on silicon. Quantum computers do exist today, though few and they're all in the hands of scientists and scientific organizations. They are not for practical and common use - that is still many years away. The theory of quantum computers was developed in 1981 by Paul Benioff, a physicist with the Argonne National Laboratory. Benioff theorized going beyond the Turing Theory to a Turing machine with quantum capabilities. Alan Turing created the Turing machine around 1935. This machine was made up of a tape whose length was unlimited and which he divided into small squares. Each square either held the symbol one or the symbol zero, or no symbol at all. He then created a reading-writing device that could read these zero and one symbols, which in turn gave these machines - the early computers - the instructions that initiated specific programs. Benioff took this to the quantum level, saying that the reading-writing head and the tape would both exist in a quantum state. What this would mean is that those tape symbols one or zero could exist in a superposition that could be one and zero at the same time, or somewhere in between. Because of this the quantum Turing machine, in contrast to the standard Turing machine, could perform several calculations at once. The standard Turing machine concept is what runs today's silicon-based computers. In contrast, quantum computers encode computer information as quantum bits, called qubits. These qubits actually represent atoms that work together to act as a processor and as the computer's memory. This ability to run multiple computations at one, and to contain several states at the same time, is what gives quantum computers the potential to be millions of times as powerful as today's best supercomputers. Quantum computers that have 30 qubits would, for example, have processing power equal to today's computers that run at a speed of 10 teraflops (trillions of operations per second.) To put this in perspective, the typical computer of today runs at gigaflop speeds (billions of operations per second. As our cry for more speed and more power from our computers continues, quantum computers are predicted to be a readily available product sometime in the not so distant future. July 15, 2011 — A sort of Holy Grail for physicists and information scientists is the quantum computer. Such a computer, operating on the highly complex principles of quantum mechanics, would be capable of performing specific calculations with capabilities far beyond even the most advanced modern supercomputers. It could be used for breaking computer security codes as well as for incredibly detailed, data-heavy simulations of quantum systems. It could be used for applying precise principles of physics to understanding the minute details of the interactions of molecules in biological systems. It could also help physicists unravel some of the biggest mysteries of the workings of the universe by providing a way to possibly test quantum mechanics. Such a computer exists in theory, but it does not exist in practicality – yet – as it would need to operate with circuitry at the scale of single atoms, which is still a daunting challenge, even to state-of-the-art experimental quantum science. To build a quantum computer, one needs to create and precisely control individual quantum memory units, called qubits, for information processing. Qubits are similar to the regular memory "bits" in current digital computers, but far more fragile, as they are microscopic constituents of matter and extremely difficult to separate from their environment. The challenge is to increase the number of qubits to a practical-size quantum register. In particular, qubits need to be created into sets with precise, nonlocal physical correlations, called entangled states. Olivier Pfister, a professor of physics in the University of Virginia's College of Arts & Sciences, has just published findings in the journal Physical Review Letters demonstrating a breakthrough in the creation of massive numbers of entangled qubits, more precisely a multilevel variant thereof called Qmodes. Entanglement dwells outside our day-to-day experience; imagine that two people, each tossing a coin on their own and keeping a record of the results, compared this data after a few coin tosses and found that they always had identical outcomes, even though each result, heads or tails, would still occur randomly from one toss to the next. Such correlations are now routinely observed between quantum systems in physics labs and form the operating core of a quantum computing processor. Pfister and researchers in his lab used sophisticated lasers to engineer 15 groups of four entangled Qmodes each, for a total of 60 measurable Qmodes, the most ever created. They believe they may have created as many as 150 groups, or 600 Qmodes, but could measure only 60 with the techniques they used. Each Qmode is a sharply defined color of the electromagnetic field. In lieu of a coin toss measurement, the Qmode measurement outcomes are the number of quantum particles of light (photons) present in the field. Hundreds to thousands of Qmodes would be needed to create a quantum computer, depending on the task. "With this result, we hope to move from this multitude of small-size quantum processors to a single, massively entangled quantum processor, a prerequisite for any quantum computer," Pfister said. Pfister's group used an exotic laser called an optical parametric oscillator, which emitted entangled quantum electromagnetic fields (the Qmodes) over a rainbow of equally spaced colors called an "optical frequency comb." 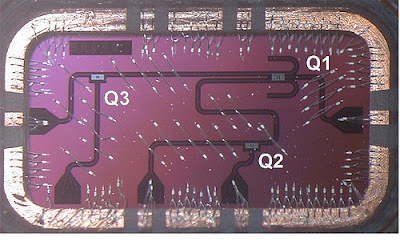 With their experiments, Pfister's group completed a major step to confirm an earlier theoretical proof by Pfister and his collaborators that the quantum version of the optical frequency comb could be used to create a quantum computer. "Some mathematical problems, such as factoring integers and solving the Schrödinger equation to model quantum physical systems, can be extremely hard to solve," Pfister said. "In some cases the difficulty is exponential, meaning that computation time doubles for every finite increase of the size of the integer, or of the system." However, he said, this only holds for classical computing. Quantum computing was discovered to hold the revolutionary promise of exponentially speeding up such tasks, thereby making them easy computations. "This would have tremendous societal implications, such as making current data encryption methods obsolete, and also major scientific implications, by dramatically opening up the possibilities of first-principle calculations to extremely complex systems such as biological molecules," Pfister said. Quantum computing can be summarized by qubit processing; computing with single elementary systems, such as atoms or monochromatic light waves, as memory units. Because qubits are inherently quantum systems, they obey the laws of quantum physics, which are more subtle than those of classical physics. Randomness plays a greater role in quantum evolution than in classical evolution, Pfister said. Randomness is not an obstacle to deterministic predictions and control of quantum systems, but it does limit the way information can be encoded and read from qubits. "As quantum information became better understood, these limits were circumvented by the use of entanglement, deterministic quantum correlations between systems that behave randomly, individually," he said. "As far as we know, entanglement is actually the 'engine' of the exponential speed up in quantum computing." Quantum computing has the potential to revolutionize the way that we use computers and the internet. Unlike traditional binary computing, in which bits must take the form of either a 0 or a 1, in quantum computing it is possible for Q-bits, as they are called, to take intermediate forms. A Q-bit can be both 0 and 1 at the same time. This increases the range of possibilities and enables quantum computing to be far more powerful than conventional computing. The speed at which a computer can work is largely dependent on its transistors. A quantum transistor can increase the speed of a computer since it is able to work significantly faster than a conventional transistor. Quantum transistors have been created using the concepts of quantum physics that enable particles to communicate across space without actually touching. In the quantum transistor, one beam of light is used to control the properties of another beam of light. This means that information can be communicated far more rapidly than with a conventional transistor. Information can be transferred without the need for any substance to actually travel the distance. The development of quantum computing will depend upon the discovery of methods of harnessing the power of quantum entanglement or of developing superconductors. The development of quantum computing and the quantum internet has some important implications for cyber security. Rather than simply reacting to threats and problems once they have already arisen, the quantum internet may enable us to take a much more proactive approach to cyber security. This is because the quantum internet will enable us to tackle security at the level of bits, which is not an approach that is possible with conventional computing. Currently, a bit must either resister a 0 or a 1, but in quantum computing, it is possible for bits to register both 0 and 1 simultaneously. When a quantum bit assumes its value, it is impossible for the bit to be copied without the sender becoming aware of it. This is because copying the bit would cause its state to change. Any threat to security would therefore be detected immediately, at the bit level. Internet users would always know when their security or privacy had been threatened, which would make surreptitious attacks impossible. Quantum technology is currently being developed that will help bring this form of protection into reality for consumers in the near future. Quantum computing could be contributing to improved cyber security for everyone within the next 20 years. - Latest results bring device performance near the minimum requirements for implementation of a practical quantum computer. - Scaling up to hundreds or thousands of quantum bits becomes a possibility. YORKTOWN HEIGHTS, N.Y., Feb. 28, 2012 /PRNewswire/ -- Scientists at IBM Research (NYSE: IBM) / (#ibmresearch) have achieved major advances in quantum computing device performance that may accelerate the realization of a practical, full-scale quantum computer. For specific applications, quantum computing, which exploits the underlying quantum mechanical behavior of matter, has the potential to deliver computational power that is unrivaled by any supercomputer today. Using a variety of techniques in the IBM labs, scientists have established three new records for reducing errors in elementary computations and retaining the integrity of quantum mechanical properties in quantum bits (qubits) – the basic units that carry information within quantum computing. IBM has chosen to employ superconducting qubits, which use established microfabrication techniques developed for silicon technology, providing the potential to one day scale up to and manufacture thousands or millions of qubits. The special properties of qubits will allow quantum computers to work on millions of computations at once, while desktop PCs can typically handle minimal simultaneous computations. For example, a single 250-qubit state contains more bits of information than there are atoms in the universe. These properties will have wide-spread implications foremost for the field of data encryption where quantum computers could factor very large numbers like those used to decode and encode sensitive information. "The quantum computing work we are doing shows it is no longer just a brute force physics experiment. It's time to start creating systems based on this science that will take computing to a new frontier," says IBM scientist Matthias Steffen, manager of the IBM Research team that's focused on developing quantum computing systems to a point where it can be applied to real-world problems. Other potential applications for quantum computing may include searching databases of unstructured information, performing a range of optimization tasks and solving previously unsolvable mathematical problems. The most basic piece of information that a typical computer understands is a bit. Much like a light that can be switched on or off, a bit can have only one of two values: "1" or "0". For qubits, they can hold a value of "1" or "0" as well as both values at the same time. Described as superposition, this is what allows quantum computers to perform millions of calculations at once. One of the great challenges for scientists seeking to harness the power of quantum computing is controlling or removing quantum decoherence – the creation of errors in calculations caused by interference from factors such as heat, electromagnetic radiation, and materials defects. To deal with this problem, scientists have been experimenting for years to discover ways of reducing the number of errors and of lengthening the time periods over which the qubits retain their quantum mechanical properties. When this time is sufficiently long, error correction schemes become effective making it possible to perform long and complex calculations. There are many viable systems that can potentially lead to a functional quantum computer. IBM is focusing on using superconducting qubits that will allow a more facile transition to scale up and manufacturing. IBM has recently been experimenting with a unique "three dimensional" superconducting qubit (3D qubit), an approach that was initiated at Yale University. Among the results, the IBM team has used a 3D qubit to extend the amount of time that the qubits retain their quantum states up to 100 microseconds – an improvement of 2 to 4 times upon previously reported records. This value reaches just past the minimum threshold to enable effective error correction schemes and suggests that scientists can begin to focus on broader engineering aspects for scalability. In separate experiments, the group at IBM also demonstrated a more traditional "two-dimensional" qubit (2D qubit) device and implemented a two-qubit logic operation – a controlled-NOT (CNOT) operation, which is a fundamental building block of a larger quantum computing system. Their operation showed a 95 percent success rate, enabled in part due to the long coherence time of nearly 10 microseconds. These numbers are on the cusp of effective error correction schemes and greatly facilitate future multi-qubit experiments. The implementation of a practical quantum computer poses tremendous scientific and technological challenges, but all results taken together paint an optimistic picture of rapid progress in that direction. Core device technology and performance metrics at IBM have undergone a series of amazing advancements by a factor of 100 to 1,000 times since the middle of 2009, culminating in the recent results that are very close to the minimum requirements for a full-scale quantum computing system as determined by the world-wide research community. In these advances, IBM stresses the importance and value of the ongoing exchange of information and learning with the quantum computing research community as well as direct university and industrial collaborations. "The superconducting qubit research led by the IBM team has been progressing in a very focused way on the road to a reliable, scalable quantum computer. The device performance that they have now reported brings them nearly to the tipping point; we can now see the building blocks that will be used to prove that error correction can be effective, and that reliable logical qubits can be realized," observes David DiVincenzo, professor at the Institute of Quantum Information, Aachen University and Forschungszentrum Juelich. Based on this progress, optimism about superconducting qubits and the possibilities for a future quantum computer are rapidly growing. While most of the work in the field to date has focused on improvements in device performance, efforts in the community now must now include systems integration aspects, such as assessing the classical information processing demands for error correction, I/O issues, feasibility, and costs with scaling. IBM envisions a practical quantum computing system as including a classical system intimately connected to the quantum computing hardware. Expertise in communications and packaging technology will be essential at and beyond the level presently practiced in the development of today's most sophisticated digital computers. Registered journalists and bloggers can download video about IBM quantum computing at The NewsMarket.